Brian Bress, born 1975, is a Los Angeles artist whose time-based media works have been described as inventive and humorous. As a creative form of portraiture, they employ flat-screen monitors often encased in frames, which make his works appear to be conventional photographs or even paintings, each depicting one or more figures rendered abstract through the use of masks and costumes. He has exhibited his work at the Museo d'arte contemporanea Roma (MACRO), (Rome, Italy); the Santa Barbara Museum of Art (Santa Barbara, California); the New Museum, (New York City); the Museum of Contemporary Art (North Miami, Florida); the Institute of Contemporary Art (Philadelphia, Pennsylvania); Arthouse (Austin, Texas); the Parrish Art Museum (South Hampton, New York); the University of South Florida Contemporary Art Museum (Tampa, Florida); and at the Salt Lake Art Center (Salt Lake City, Utah). Currently Bress has a commissioned three-channel work on view at LACMA's Stark Bar. 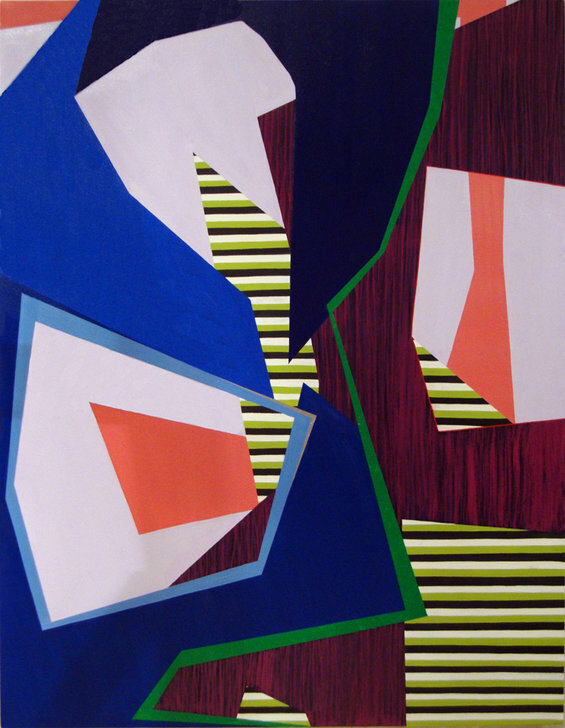 The piece, titled Idiom (Brian, Raffi, Britt), depicts three different “characters” that slowly emerge and reveal themselves to the viewer, showing Bress’s interest in the ambiguous zone between figurative representation and abstraction. Lawrence Atoigue, professionally known as Naturel, is an expressive artist who has quickly emerged in today’s contemporary scene. 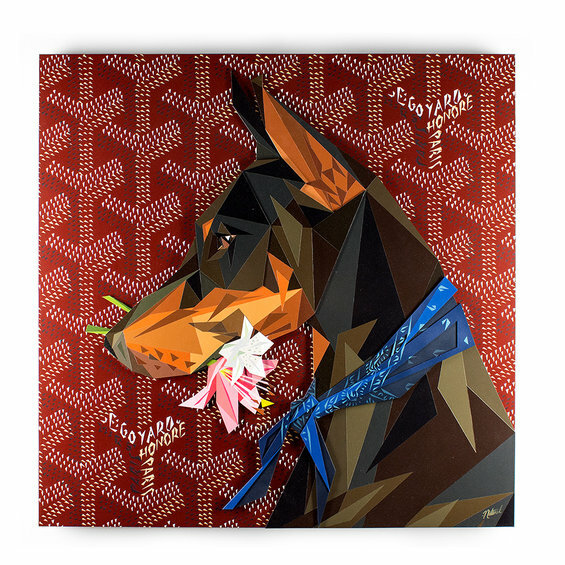 His futuristic illustrations have successfully blended methods of Pop and Cubism with a surrealist vision, turning these elements of modern culture into art using sharp, mosaic-style angles and colors. His talents have attracted the eyes and ears of celebrity clients such as Macklemore, LeBron James, Swizz Beatz and countless others. Born in 1983 to an aircraft mechanic in Guam, Naturel can remember loving music and art as a child. After his father’s work was completed in Guam, Naturel’s family moved to Prince George’s County, Maryland, a place he says afforded few opportunities for under-served kids. He persevered and landed a spot at Brooklyn’s Pratt Institute, where he learned what it takes to become a graphic designer and artist. 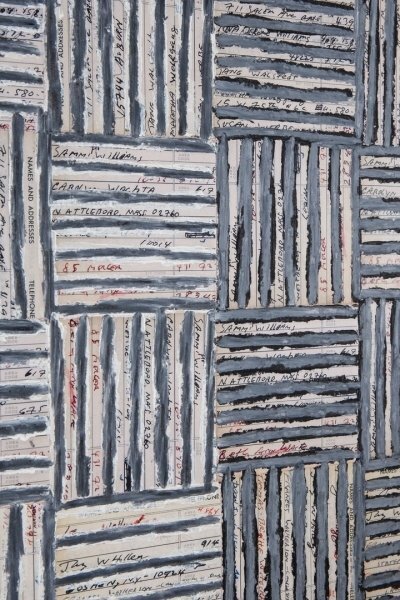 For the past 40 years, McArthur Binion, who describes himself as a “Rural Modernist,” has been producing unconventional, deeply autobiographical abstract compositions. Born in 1946 and raised in Detroit, Binion was the first African-American to graduate from Cranbrook Academy of Art with an MFA. 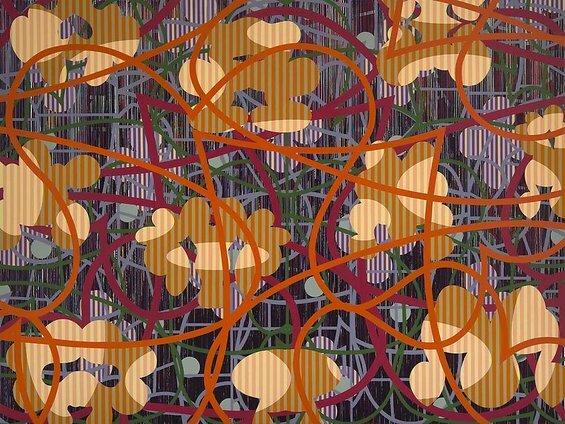 Doing away with brushes and paint, Binion used oil stick, crayon, and, more recently, laser-printed images to create his lushly textured and geometrically patterned works. Binion’s recent bodies of works, his DNA series, are notions of self-awareness and self-discovery. 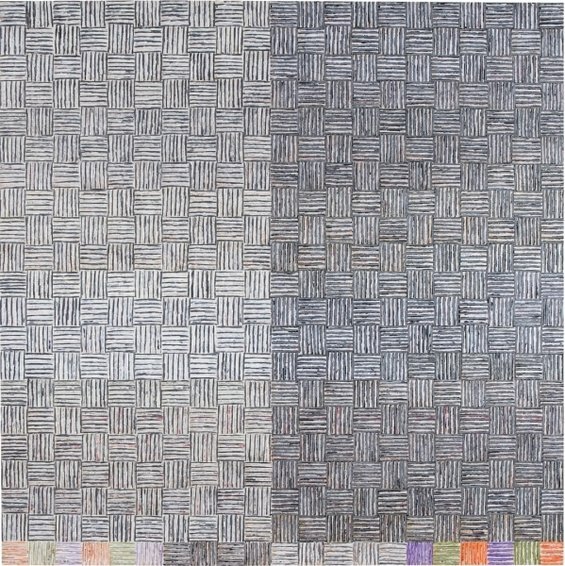 He has layered photocopies from his address book from the 1970s into collaged tiles, creating fields of abstract color. On close inspection these rhythmic panels divulge the names of Basquiat, Mary Boone, Meryl Streep among others: all friends or casual acquaintances. This document of the who’s who of artists, art dealers and actors uncovers Binion’s personal history. 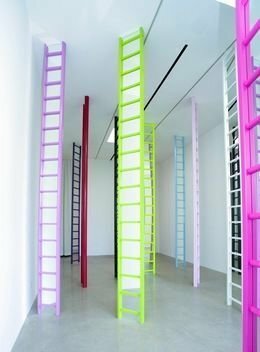 Though his first love is music, Jim Lambie is celebrated for his mixed-media sculptures and installations, into which he incorporates popular culture and neon-bright colors to create hallucinatory, site-specific meditations on industry, art-making, and contemporary life. Claiming that he wants to set up “intense psychological spaces,” Lambie has transformed various sites, including Scotland’s inaugural pavilion at the 2003 Venice Biennale, while staying true to their architecture. A contemporary visual artist who was shortlisted for the 2005 Turner Prize, his practice is underpinned by his interest in color theory and music, the psychological resonance of space, and utopian artistic movements. Like rock-n-roll, Lambie’s work is edgy and exuberant, and surrounds viewers with a mashed-up vision of the world in which we live. Laura Mosquera uses the language of architecture to articulate her interest in constructing scenarios and configurations as symbolic confined spaces. These are dynamic, sometimes aggressive, compositions inspired by a contemporary, urban environment. It is an exploration of the physical and psychological world with the foreground and background often shifting to undermine our perception. Color, pattern and texture are used to lure the viewer. The work takes advantage of the materiality of the paint to simultaneously exhibit both a stillness and optical speed. A permanent installation of paintings has been installed at the Archer Heights Library commissioned through the City of Chicago, and 8 billboards of her paintings continue to be exhibited at the Red Line Subway station at Chicago Avenue and State Street sponsored by the Museum of Contemporary Art and the CTA's Adopt a Station Project. Currently, she is living and working in Brooklyn, NY. Daniel Knorr, born in 1968, has worked with a wide variety of materials, many of them discarded, including LED screens, shards of glass found on city streets, and pulverized secret police files. 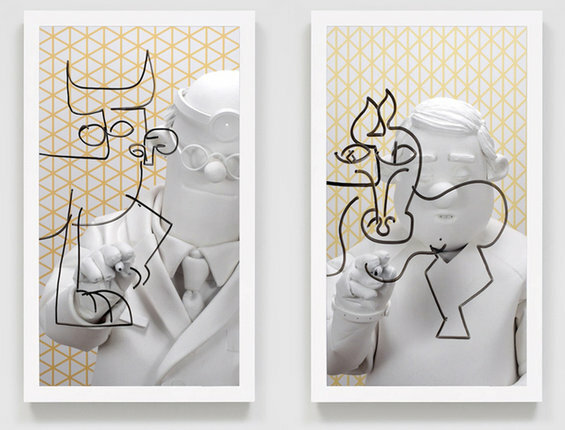 With these, as well as with photographs and his own drawings, he creates sculptures, animations, installations, and exhibitions through which he examines history and its resonances in contemporary life, societal systems and national identity. Among the places Knorr has explored and transformed into art is Los Angeles and its cracked and pot-holed streets. 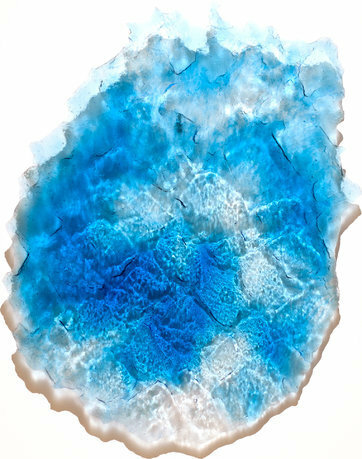 As a part of his ongoing “Depression Elevations” series, the artist sought out these urban flaws and cast them in transparent colored polyurethane. 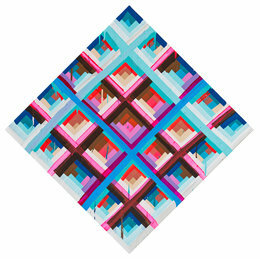 In glowing shades of crimson, pink, orange, and blue, these casts appear as striking, luminous abstract wall sculptures. For the artist, they also stand as records of the city’s unique topography, shaped and worn by years of use by people in their cars. 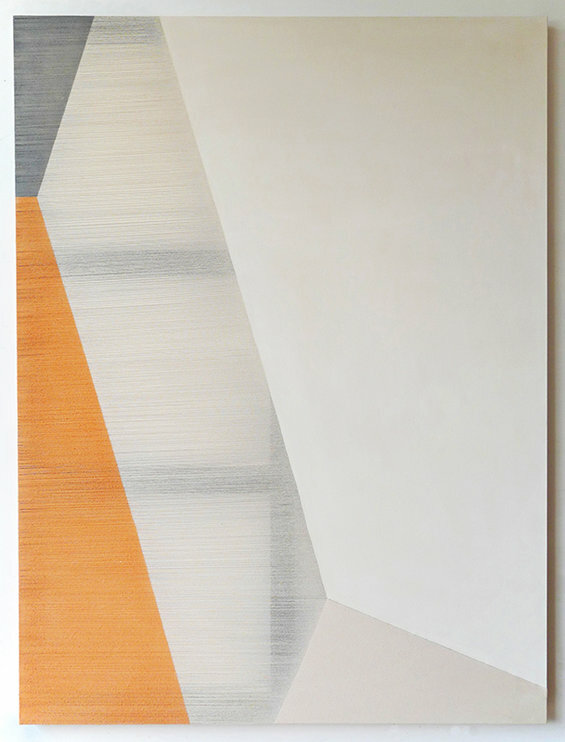 Rebecca Ward’s work asserts its power through geometric abstraction. The artist balances line, form, and space in her painting and installation practice. She concurrently deconstructs the detached, fabricated aesthetics of her work by delicately stitching and unraveling the canvas. 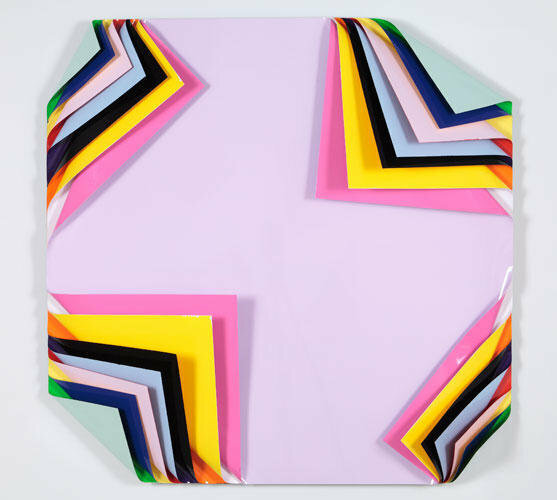 She uses this language of abstraction to decisively break apart painted material and piece it back together, referencing contemporary culture and craft. Ward currently lives and works in New York City. She has exhibited extensively in the United States, Europe, and South America. With their symmetrical compositions, intricate patterns, and lush colors, Maya Hayuk’s paintings and massively scaled murals recall views of outer space, traditional Ukrainian crafts, and mandalas. Hayuk weaves visual information from her immediate surroundings into her elaborate abstractions, creating an engaging mix of references from popular culture and advanced painting practices alike while connecting to the ongoing pursuit of psychedelic experience in visual form. She has painted her iconic outdoor murals all over the world and, when not traveling, maintains an active studio in Brooklyn, sketching in paint to inform her large-scale works. Hayuk’s work has been the subject of one-person exhibitions and commissions at venues including The Bowery Wall, NY (2014), The Hammer Museum, LA (2013), The Museum Of Contemporary Canadian Art, Toronto, Canada (2013), and Socrates Sculpture Park, Queens, New York (2011). 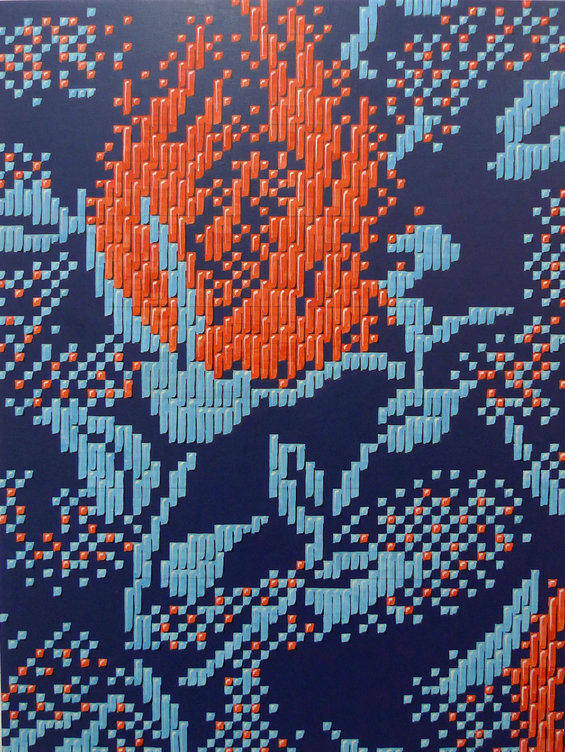 Caitlin Keogh, born in 1982, produces finely detailed paintings and drawings of textile patterns and fashion accessories, reveling in the beauty and technique of designing, making, and wearing clothing. Her interest in drawing and painting developed synonymously with learning to sew and loving fabrics. She sources the patterns for her paintings, which mimic swatches of woven or printed fabric, from scraps of cloth and images in books and online.